Whether you have health needs that make an adjustable bed necessary or you just want to sit up in bed to read or watch TV, our handy guide to the top adjustable bed frames on the market should make your shopping easier. We picked the Nectar Sleep Adjustable Bed Frame as the top adjustable bed this year for it’s excellent value, great sleep trial period, and massage function. Our runner-up pick is the Tomorrow Sleep Adjustable bed because it has an amazing one year sleep trial and handy USB ports, also at a great price. Adjustable beds have grown in popularity in recent years and are no longer reserved only for helping elderly people in and out of bed. These days, adjustable beds can be helpful for providing a more comfortable position while relaxing or watching TV and can even come with massage settings, for the ideal way to unwind after a long day at work. Amerisleep plant-based memory foam mattresses and state-of-the-art adjustable bed bases make this option a strong contender on our list. With a choice of firmness levels, a split-bed option, and additional features, such as under-bed lighting and Wallhugger® engineering, this adjustable bed has enough versatility to provide a great night’s sleep, whatever your preferences. You and your partner have different sleep preferences: Not only does the Amerisleep foam mattress prevent motion transfer when sleeping with a partner, this brand also provides a split adjustable bed option. This is perfect if you and your partner have different sleeping preferences and it even allows one of you to lay down completely, while the other props their head up to continue relaxing or reading. You are not sure what firmness level you want: Amerisleep has three different firmness options for their adjustable bed package: soft (AS4), medium (AS3), and firm (AS2), so you can read about each different feature and test which level of firmness is most suited to you. You want a bed with a massage function: The Amerisleep mattress comes with dual, full-body wave massage for optimum versatility and comfort from head to toe. You want an eco-friendly mattress: Amerisleep mattresses are made with plant-based materials, which mean less petroleum is used in the manufacturing process, making it a more eco-friendly option than many other memory foam mattresses on the market. The Amerisleep adjustable bed comes with a range of features designed to help you create the best sleep environment for your preferences. Key features include a capacitive-touch remote with a tabletop holder to keep it in reach at all times, offering adjustable settings including a pillow tilt, programmable positions, and an anti-snore button. The adjustable base also comes with a dual, full-body wave massage function with a variety of intensities, providing the perfect way to unwind and relax after a long day. The dual option is also perfect if you are sharing your bed with a partner – so you can enjoy a blissful massage, even if they don’t want one! Another fantastic feature of the Amerisleep design is its Wallhugger® engineering, which lifts you up and back rather than moving you away from your nightstand as you adjust your position. This is just an extra touch that makes life so much easier when you need to keep things in easy reach, whatever position your bed is in. With regards to the Amerisleep mattress itself, the adjustable bed package comes with a choice of three Amerisleep mattresses: the AS4 (soft), the AS3 (medium), and the AS2 (firm), allowing you to pick the option that suits your needs best. The AS2 mattress is described as a top-selling mattress for people who sleep on their back or front, while the AS4 provides additional cushioning for side-sleepers. The AS3, meanwhile, is a versatile option that provides a good balance of support and softness and can be a good choice if you sleep in numerous positions. The Amerisleep adjustable bed is backed by a 20-year warranty, protecting it against defects in materials or workmanship. What’s more, Amerisleep mattresses also come with a 20-year warranty, with a full repair offered in the first 10 years, and a prorated warranty for the last 10 years, so you can rest easy knowing your investment is well protected. The Nectar adjustable bed provides the ideal way to customise your sleep setting to suit your exact preferences. With features such as a zero gravity setting, settings to combat snoring and acid reflux, and three programmable memory settings, the Nectar will provide the strong, supportive base you need for a sleeping environment perfectly adapted to your needs. You want a massage feature: The Nectar adjustable base comes with a three-zone massage feature, providing the perfect way to unwind and relax after a long day. You want a bed that adjusts at both ends: This mattress is fully adjustable, with a zero gravity setting allowing you to put both your head and feet up in whatever position suits you best, either for sleeping, reading, or for relaxing during the day. You want a wireless remote: A big bonus of the Nectar adjustable base is that it comes with wireless remotes and USB plugs, providing optimal convenience, so you can stay comfortable in bed whether you want to charge your phone or adjust your position. You want to test the bed before you buy it: This option comes with a 100-night sleep trial period, so you can fully test whether this is the right bed for you before you commit to buying it. 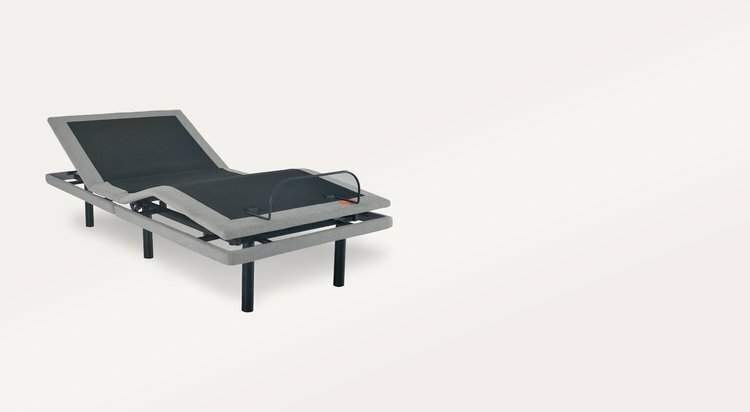 The Nectar adjustable bed is one of the easiest beds on our list to set up and only requires you to screw in two legs after the mattress is delivered to your door. There are a wide range of features that come with the Nectar adjustable bed, including a three-zone massage option for optimum comfort, a wireless remote, and USB ports, as well as a number of settings, including zero gravity and TV recline. Another great feature of the Nectar bed is the anti-snoring and acid reflux features, with the option to elevate your head to open up air passages to reduce snoring and acid reflux symptoms. 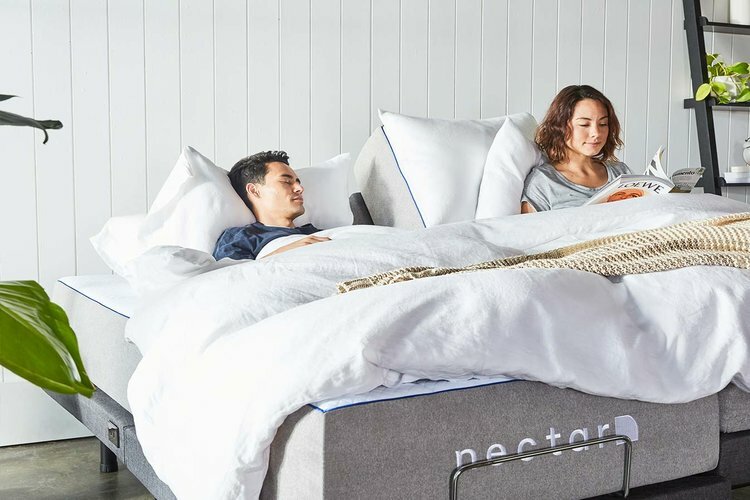 The Nectar mattress itself is a comfortable, high-quality memory foam bed, designed to provide a comfortable, bouncy feel that supports your body and keeps you cool as you sleep. Described as medium-firm, this mattress achieves an excellent balance between softness and support, so you can enjoy the contouring feel of memory foam without overheating or sinking too much into the mattress. The Nectar adjustable bed comes with a three-year warranty against defects in electrics, drive motors, and massage components. What’s more, the package also comes with a 100-night sleep trial period, allowing you to really test the mattress and its features against your sleep preferences before you decide to commit to it. A lot of thought and care has gone into the construction of the Leggett & Platt Prodigy 2.0, with features such as an anti-snore, wave, and massage function, a remote control, and built-in USD ports to ensure optimum comfort and ease of use. With a host of customisable features and dual settings, so you and your partner can select different preferences, it’s no wonder this mattress is such a popular choice. You and your partner want dual settings: The Leggett & Platt Prodigy 2.0 has dual settings, so you and your partner can adjust both sides of the bed separately, without affecting the other. Perfect if one of you is an early riser or often late to bed! You want an anti-snore feature: This adjustable bed has a customizable pillow tilt option, which not only provides a more comfortable way to read and watch TV, but can also help to reduce snoring and alleviate symptoms of sleep apnea. You want a completely adjustable base: The Leggett & Platt Prodigy 2.0 is fully adjustable and the base even comes with adjustable legs, so you can set the height of your bed to suit your needs. You want a long warranty: This adjustable bed comes with a 1-3-25 warranty, with a full warranty for the first year and a limited warranty for the remaining years. The Leggett & Platt Prodigy 2.0 is another impressive adjustable bed with features that seem to attend to every sleeping need. The bed is fully adjustable, with a dual full-body massage function using wave technology, and Wallhugger® engineering to keep you close to your nightstand in any position. This adjustable bed even comes with a mobile app, allowing you to easily control the settings of your adjustable bed from your phone. Settings included within the app include a sleep timer, a gentle-wake alarm, full-body wave massage, and programmable positions. Other excellent features of the Leggett & Platt Prodigy 2.0 include MicroHook™ technology, which prevents your mattress from slipping as the bed moves and under-bed lighting for functionality and to add some ambience to your bedroom. All settings can easily be controlled by the capacitive-touch remote, which comes with a convenient tabletop holder to easily keep it within arm’s reach, at all times. The Leggett & Platt Prodigy 2.0 adjustable bed comes with a 1-3-25 warranty, which means you’ll have a full warranty on the base for the first year, a limited warranty for the second through third years, and another limited warranty for the fourth – 25th years. The Reverie 7S Adjustable Bed is another strong contender in this list, featuring 10 different massage settings, wall-hugging technology, two memory positions, and a 20-year warranty – all for an extremely reasonable price. No adjustable bed could really be described as a ‘budget’ option, but the Reverie is in an excellent price range for the features it offers. You want a massage setting: The Reverie 7S has an ingenious built-in massage system, with 10 customizable options, varying in intensity. The massage feature uses wave technology to provide comfort and relaxation when you need it, with the option to select the massage feature for the head and foot simultaneously, or separately. You need lumbar support: The Reverie 7S Adjustable Bed features advanced lumbar support with 100 different points of adjustment. If you are looking for an adjustable bed due to back and joint pain, the spinal support the Reverie 7S can provide makes it a good option. 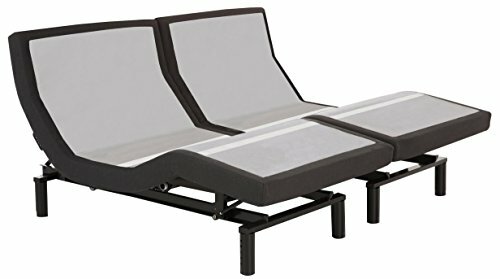 You and your partner sleep in different positions: This adjustable bed comes with a medium-firm memory foam mattress, designed to contour to the body in all kinds of sleeping positions. 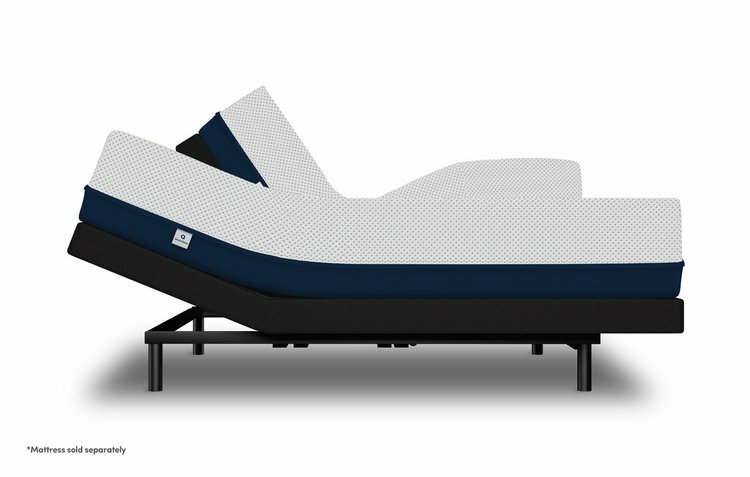 You want a mattress with a high weight capacity: The Reverie 7S Adjustable Bed has a weight capacity of up to 850 lbs, providing a strong and supportive base for heavier sleepers. The Reverie 7S Adjustable Bed has a stable, supportive base with a strong motor to effortlessly lift up to 850 lbs. Designed with lumbar support in mind, this highly-customizable bed is ideal for people looking for an adjustable mattress to provide personalised support for back pain, joint aches, and pressure points. This adjustable bed comes with a host of features, including an excellent massage feature with 10 different settings of varying intensities, with the option to select the massage feature for your head, feet, or both. If you’re looking for an adjustable bed that will provide the perfect setting to unwind and relax in the evening, the Reverie 7S provides plenty of opportunities. Another feature of the Reverie 7S is its Bluetooth® Mobile Module, which can be controlled by any device with Bluetooth or via a free app. This setting allows you to individually control the bed independent of the remotes that come with it, allowing you to sit back and relax in any setting of your choosing. Alongside the Bluetooth Module, the bed also comes with two wireless remotes with programmable settings, include anti-snore and zero gravity options to ensure you get a comfortable night’s sleep in whatever position suits you best. 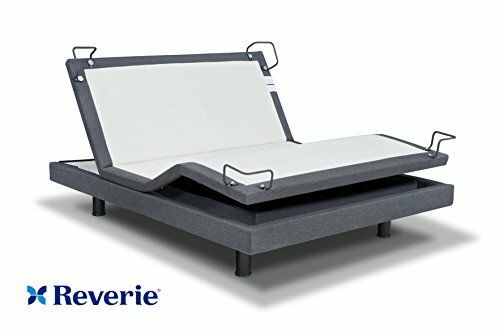 The Reverie 7S is made in the USA and comes with a 20-year hassle-free warranty, so you can rest assured that you’ve invested in a quality adjustable bed made to withstand the test of time. 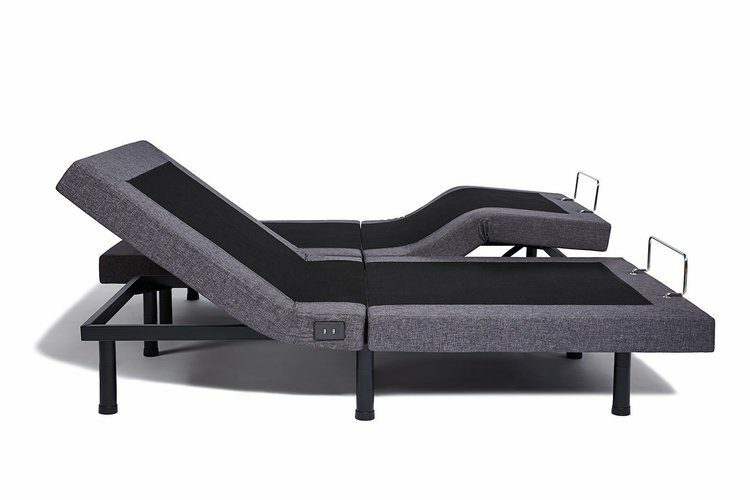 The Tomorrow Sleep bed has several fully adjustable features, including an anti-gravity setting, anti-snore setting, and built-in USB ports for optimum comfort whether you’re relaxing in bed and want to raise your head to watch TV, or if you want to customise your sleeping position to suit your needs. You need an adjustable bed for health conditions: If you are looking for an adjustable bed because you suffer from a sleep-related condition, such as sleep apnea or acid reflux, the Tomorrow Sleep bed has adjustable settings that claim to help relieve these conditions. You have poor blood circulation: The Tomorrow Sleep adjustable bed also comes with a zero gravity setting, designed to alleviate pressure on the neck and back. This is particularly good for improving blood circulation around the body. You often snore while sleeping: The Tomorrow Sleep’s anti-snore setting is designed to help to open the airways and elevate the head, making for a much more comfortable sleeping environment and reducing the likelihood of snoring. You want to test your mattress before buying: This adjustable bed comes with a 100-night sleep trial as well as a three-year warranty. If you’re not 100 percent this mattress is right for you, the sleep trial provides the perfect time to test it first. The Tomorrow Sleep adjustable mattress is designed to provide comfort and support in a range of sleep positions. The bed is easy to set up once delivered, so, unlike some adjustable beds, you won’t be faced with the daunting task of assembling the base from scratch, once it arrives in your home. Features include a zero gravity setting, proven to reduce stress and fatigue, and improve blood flow, an anti-snore setting to elevate the head and an open the airways, as well as a ‘TV’ setting and a ‘Rest’ setting that gently elevates your feet and head for a more comfortable sleep. This adjustable bed also comes with built-in USB ports for easy access when charging your electronic devices. The Tomorrow Sleep bed is available in a range of sizes, including Queen, Twin XL, and Split King. You can, therefore, pick the adjustable base best suited to the size of your mattress, rather than worry about buying both an adjustable bed and a new mattress to fit on it. Finally, this adjustable bed comes with a 365-night sleep trial period, providing you with plenty of opportunities to get comfortable with using the settings and truly testing how comfortable you are, before committing to buying it. Adjustable beds tend to be more expensive than regular beds, due to their multiple features and customizable options. However, there can still be a lot of variance in price amongst adjustable bed brands, so it’s worth doing your research and finding the best price for your budget. When you’re investing in an adjustable bed, you want to make sure you’re investing in a bed that can withstand the test of time. Check for a long warranty (many adjustable beds have 20+ year warranties), as a sign of a bed built to last. Do you want an adjustable bed that will simply allow you to elevate your head or feet? Or do you want a base that has USB charging stations, massage features, and a full range of motion? Many newer adjustable beds on the market come with these features for the ultimate relaxing experience, so ascertain what you want before shopping. 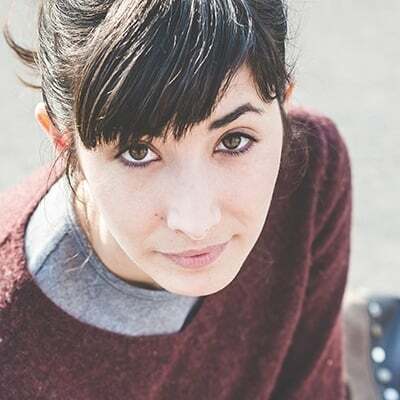 Would you rather not buy a new mattress and an adjustable bed base? Make sure the adjustable bed you are buying is compatible with your existing mattress before buying to avoid disappointment. Most innerspring mattresses, for example, aren’t compatible with adjustable bases – a memory foam or latex mattress is better suited to contouring to your body in every position. An adjustable bed is no longer just an option for those in the hospital or for the elderly: while fantastic at helping you get in and out of bed, adjustable mattresses now go above and beyond to provide you with a fully customizable sleeping environment. These days, adjustable beds can do so much more than simply elevate your head or prop up your feet. You can find beds with built-in USB ports, under-bed lighting for optimum convenience, and multiple massage settings for total comfort. Overall, the best adjustable bed for you is the one that meets your needs best. Whether you’re looking for an adjustable bed that simply elevates you for assistance getting in and out of bed, or you’re looking for one with all the bells and whistles, the options reviewed above are all excellent contenders. PrevPreviousFoam vs Spring Mattress Guide 2019: Choosing Between A Foam or Innerspring Bed – Which is Best?